Amazon.com’s Buy Box is the top right section on a product page where customers can directly add items to their shopping carts. Since many sellers on Amazon.com can sell the same product, they must compete to “win the Buy Box” for a certain product. 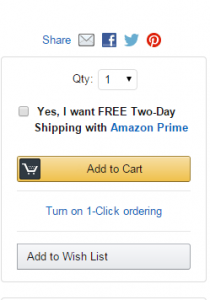 Winning the Amazon Buy Box simply means that you were chosen for the Buy Box placement. When you win this placement, customers have a button to directly add your product to their carts, giving you an advantage over competing sellers. Generally, one “New” and one “Used” condition offer will win the Buy Box, depending on the product. For a seller to be eligible for the Buy Box, they must meet a set of performance-based requirements including order defect rate, customer shopping experience, time and experience on the Amazon selling platform, and status as a professional seller. If multiple sellers meet the eligibility requirements, then Amazon.com compares these sellers on metrics including pricing, availability, fulfillment options, and customer service and decides on a winner.